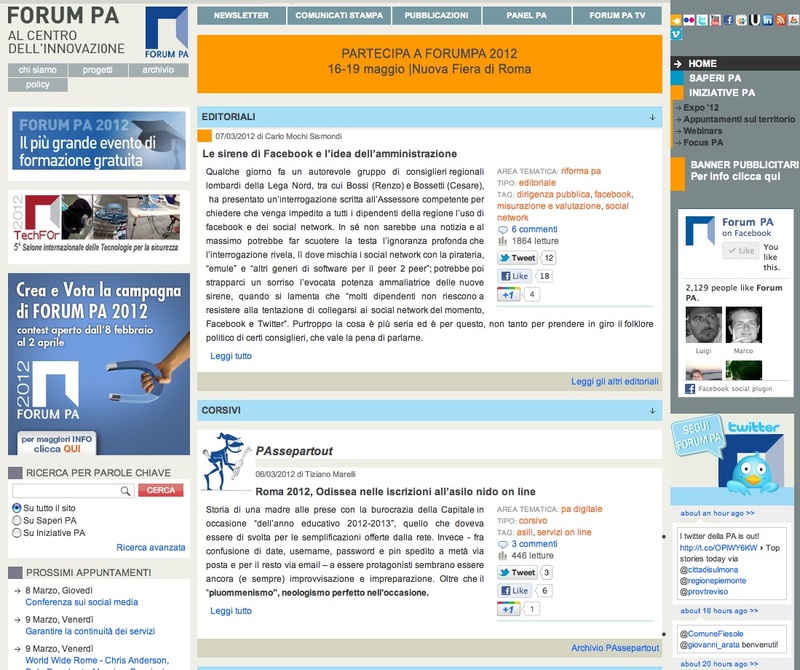 FORUM P.A. is a corporate initiative held in Rome under the sponsorship of the Italian government and other institutional and public partners. Its main goal is to activate an open communication channel among public administrations, companies and citizens on issues related to the quality and efficency of public services, in particular by organizing a regular annual meeting. The website of this inititative provides information about the annual meetings with material as speeches, ppt presentations, conference reports, etc., as well as about other, mainly institutional, initatives on PA and local and national administrations. All documentation is retrievable for free by all users in their full-text version in variuos formats (usually pdf or doc files). A proceedings archive contains the documents of the last four Forum PA meetings, as well as an observatory on PA best practices and projects. The main pages are now available in english while three thematic standalone channels (Altra Pa, Reset and Sanità elettronica) can be reached from the homepage giving more specialized information to the users.